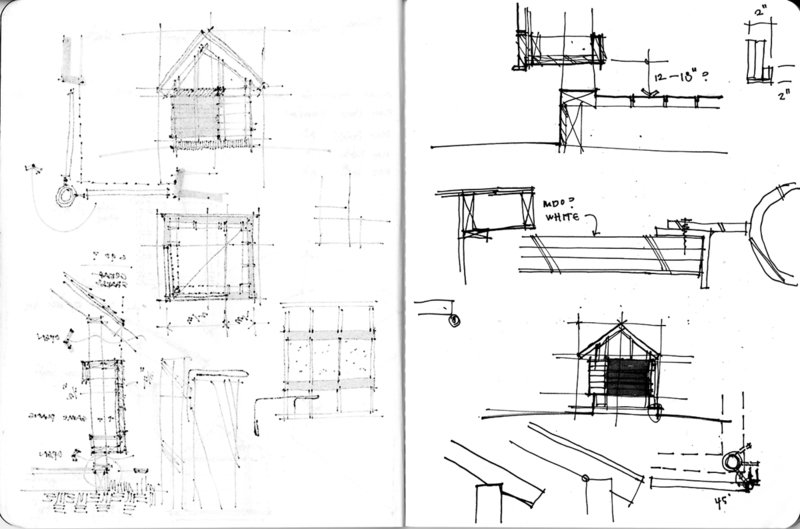 The Life of an Architect playhouse competition for 2015 is coming to a close – even though it seems like it just got started. All the entries for this year are required (give or take) to me in my email inbox by midnight tonight (April 20th). Actually, since this is for charity and I consider myself a decent human being, as long as I have your entry by the time I wake up, you’re good to go. Today is the day that – as I have done in previous years – is show everyone what my playhouse will look like … which seems only fair to me. 1. They should have some purpose to them beyond the first few weeks when they show up in the winners backyard. This is a big deal for me simply because I am the father of a 10-year-old and I know my daughter’s interests evolve from day-to-day. What she loves today will be replaced with what she loves tomorrow … and that’s okay with me. Unfortunately, it makes designing these playhouses that much more difficult. 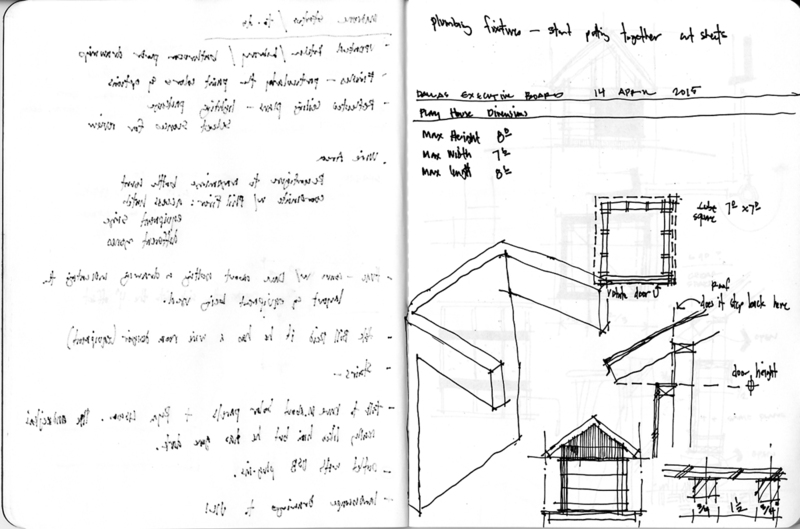 Designing playhouses around a theme is advice I give to everyone who asks but I rarely follow that advice myself. 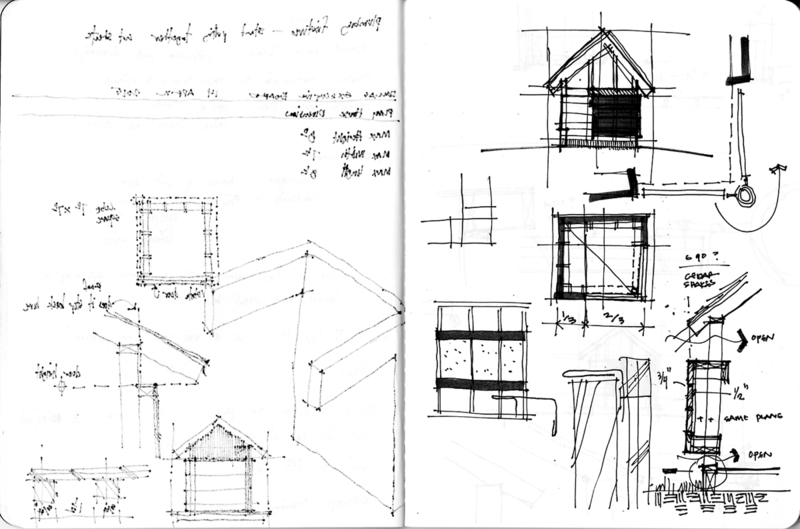 Then again, I’m not trying to win a playhouse design competition. 2. They need to be designed with consideration on how they are to be built so that these playhouses are affordable. I think that I owe it to the contractors that I convince to donate their time and money to support this cause to design a playhouse that doesn’t become a financial burden to them. I think I must be a doing a good job because the same contractor has built my playhouse every year for the last 6 years. Additional evidence to support this is that several of my playhouses have been built by weekend DIY warriors from around the globe (here) and since I make my construction drawings available for free, why not build one yourself? The challenge for me has now become how to design (and document) a playhouse in 8 hours AND have it reflect my own design interests. I will concede that while I am typically fond of my own designs, they are not the most popular. Even though it’s not the kids putting raffle tickets into the box, they are the ones that are convincing their parents. You can click on some of these images to get a better look – although I’m not sure why you would want to. I thought it would be interesting to show – unedited – what my process sketches look like, which is why I have my entire sketchbook shown. You’ll be able to see for yourself (since my pen bleeds through the pages) that no editing has taken place. I’m not sure this was a good idea, I think I might prefer the illusion people have that I am good at sketching. Most of the studies I am making have to do with how this playhouse would be built, the massing, and the proportions of the playhouse. Other than possibly being embarrassed by showing them here, I treat my sketchbooks without any fanfare. I don’t think of them as tomes of art collections and as a result, I don’t try to compose my pages. If there’s some room, I put something on the page. Here it is … The Backyard Movie Theater (in a worm’s eye perspective no less!) Isn’t is amazing?!? …. Well, my daughter wasn’t particularly impressed either. Most of the playhouses I design come across much better once they’re built because I put so much emphasis on the details. The contractor who builds my playhouse every year is really talented and I can get away with simple designs because they are built so carefully. In this view, you are looking at the playhouse with the movie screen in the closed position – it’s the grey square that you see on the gable end elevation. There are two equal sized openings and in the corner, there will be a steel post that the screen will cantilever off from. You will be able to pivot this grey panel 270 degrees to manipulate whether or not you want the screen available on the inside of the playhouse or on the outside. Here is the same view with the screen rotated into position that would allow for a group of people sitting in the yard to view a movie. If I had to submit my own design in to the playhouse competition, I probably would have put the time in to illustrate people sitting on blankets, globe lights zig-zagging overhead, kids chasing lightning bugs, etc. Before any of you nerds point out that my “movie screen” isn’t 16:9 aspect ratio, that would be for television – however – your point is well taken. The typical ratio of a movie screen is typically 1.85:1 or 2.39:1 and my panel above is more in the 1:1 ratio (it actually measures 3′-7″ wide and 3′-5″ tall). I made this door the size it is for architectural reasons more so than true cinematic performance reasons. To help you get an idea of the scale and proportions, let’s take a walk around the playhouse and look at the elevations. The scale figure I use is 5′-8″ tall. Since these are playhouses for children, I’m not too worried about making a grownup duck to enter the space, but I do want to make it tall enough in the middle so that they can at least stand up full height. The grey panel above is the pivoting screen panel and is currently in the “watch a movie from inside the playhouse” position. Here’s the side view with the screen in the same position as above. … and now the screen has been rotated into the “watch from the backyard” position. Rear (or side elevation) … amazeballs. And finally, the Side (or Rear) elevation. (wiping tear off cheek). As far as the materials go, I have a few pallets in mind but I will work them through with the contractor to find an appropriate balance between my aesthetic wishes and his financial concerns. My flexibility in this regard is important and I have no question plays a role in getting the same contractor to build my playhouses year after year. Today is the day that entries from all over the world are being sent to my inbox for the 3rd Annual Life of an Architect Playhouse Design Competition, and while I am not one of the judges, my role is to make sure that the people who are judging the entries understand all the little nuances that go into designing these little buildings. Next Monday I will announce the top 20 finalists to this years competition and the Monday after that I will announce the winners. I hope everyone will come back and support the participants and the winners.